BELLEVILLE – Every time Tina Sedore puts her son to sleep, she just hopes he will wake up the next morning. “I’m terrified that something will happen in the night, and I’m always waking up and making sure he’s still breathing,” the Belleville resident says. “I just love him. He actually sleeps right beside me. He won’t sleep unless he has his hands on me – has his hands on my face or in my hair. If I move in the night he automatically wakes up. So we’re really close,” she said. Lincoln Drake, three, has been battling cancer since he was 13 months old. When Sedore and Lincoln’s father, Jamie Drake, noticed that their son wasn’t sitting up, eating or walking, they went to see a doctor. He noticed that Lincoln’s head was bigger than it was supposed to be. Lincoln underwent a nine-hour surgery. Sedore described it as horrible. Lincoln started 70 weeks of chemotherapy on June 22, 2017. The family had to travel between Belleville, Toronto and Kingston for his treatments. They tend to get dirty looks when they are out with Lincoln, she said. “Little kids – they don’t know the difference but they’re always asking, ‘What’s wrong with his face?’ and, ‘What’s wrong with him?’ and questioning why he can’t walk. It’s hard to explain to little children what’s wrong,” she said. 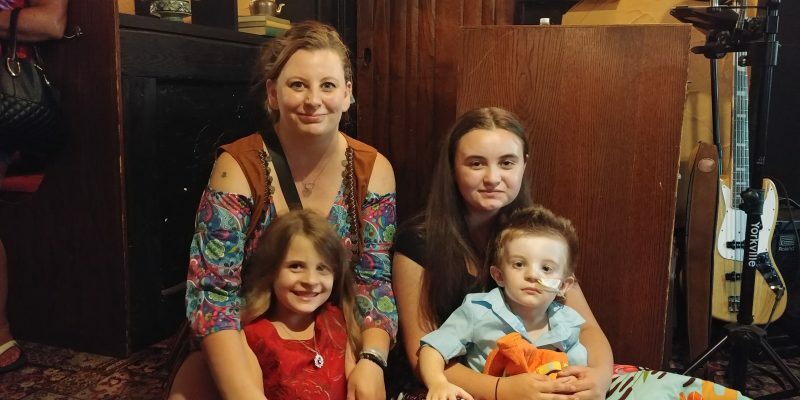 Sedore and her family were at a fundraiser for Lincoln at the Beaufort Pub this fall that raised over $4,100 from a packed group of supporters. “It was amazing. I didn’t expect that. When I first arrived, I thought it would be a nice night, but I did not expect that many people,” Sedore said. The most heart-warming moment was when well-known Belleville musician Andy Forgie sang a song for her son, she said. Even though a tumour has hindered Lincoln, he still finds ways to communicate with his family. Her son has tremendous amounts of strength and courage to have been fighting every single day, she said. If you’d like to support Lincoln and his family, you can do so through their Facebook page, Lincoln’s Fight.